IMG_4099, originally uploaded by bukowski_jr. Mosaic, originally uploaded by Sir_Iwan. Cat mosaic on kindergarten building in Nakło Śląskie, Poland. 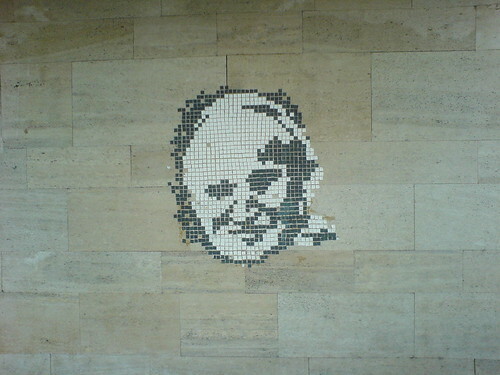 Pope Mosaic, Krakow, originally uploaded by Ophiuchius. It’s already been 2 years since Pope John Paul II died. One of Poland’s greatest sons. 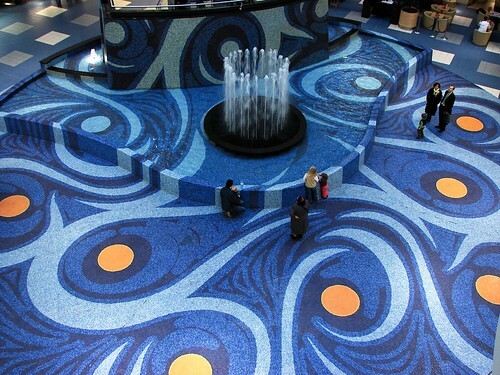 Blue city, originally uploaded by tonninods. night town, originally uploaded by oliwa72. This mirror is one of my favourites. 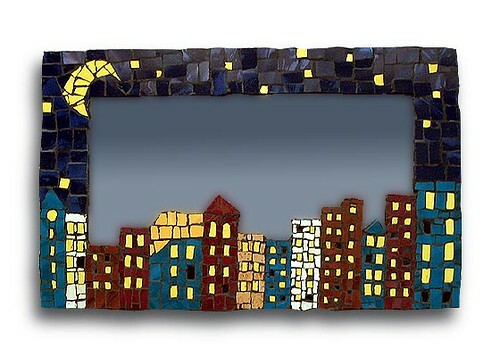 Have a look at his website http://tygiel.go.pl/ and you can check out where the mosaics are for sale. owls, originally uploaded by oliwa72. 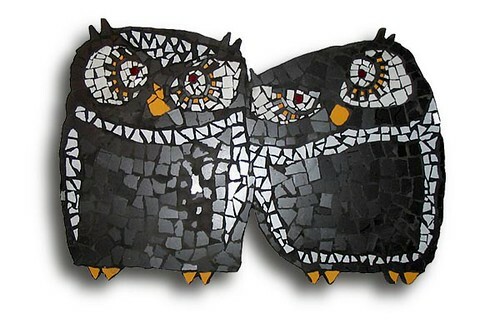 A mosaic panel from oliwa72 showing that not only does he mosaic cats, he also mosaics rather cute owls. I’d happily put these up on my wall. Doctoro Esperanto, originally uploaded by mackley. Today is Ludwik Lejzer Zamenhof’s birthday. Who is the good Dr Zamenhof? Zamenhof was born on December 15, 1859 in the town of Białystok (in Poland, then part of the Russian Empire) to parents of Lithuanian Jewish descent. The town’s population was made up of three major ethnic groups: Poles, Belarusians, and a large group of Yiddish-speaking Jews. Zamenhof was saddened and frustrated by the many quarrels between these groups. He supposed that the main reason for the hate and prejudice lay in mutual misunderstanding, caused by the lack of one common language that would play the role of a neutral communication tool between people of different ethnic and linguistic backgrounds. As a student at secondary school in Warsaw, Zamenhof made attempts to create some kind of international language with a grammar that was very rich, but also very complex. When he studied English (along with German, French, Latin and Greek), he decided that the international language must have a relatively simple grammar with a wide use of suffixes to make new forms of the words. By 1878, his project Lingwe uniwersala was almost finished. However Zamenhof was too young then to publish his work. Soon after graduation from school he began to study medicine, first in Moscow, and later in Warsaw. In 1885, Zamenhof graduated from a university and began his practice as an ophthalmologist. While healing people he continued to work on his project of the international language. For two years he tried to raise funds to publish a booklet describing the language until he received the financial help from his future wife’s father. In 1887, the book titled as “Lingvo internacia. Antaŭparolo kaj plena lernolibro” (International Language. Foreword And Complete Textbook) was published under the pseudonym “Doktoro Esperanto” (Doctor Hopeful), from which the name of the language derives. For Zamenhof this language wasn’t merely a communication tool, but a means of spreading his ideas on the peaceful coexistence of different peoples and cultures. Among the many works he translated into Esperanto is the Hebrew Bible or Old Testament. Zamenhof and his wife Klara raised three children: a son, Adam, and two daughters, Sofia and Lidia. All three perished in the Holocaust. 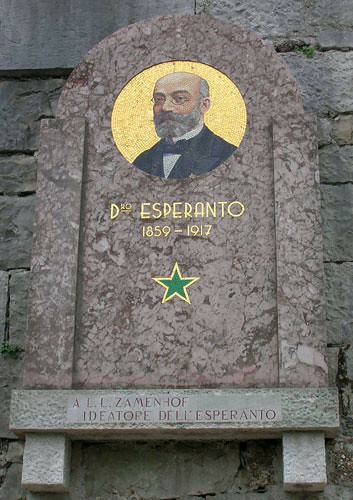 Lidia Zamenhof in particular took a keen interest in Esperanto, and as an adult became a teacher of the language, traveling through Europe and to America to teach classes in it. Through her friendship with Martha Root, Lidia accepted Bahá’u’lláh and became a member of the Bahá’í faith. As one of its social principles, the Bahá’í faith teaches that an auxiliary world language must be selected by the representatives of all the world’s nations. Zamenhof died in Warsaw on April 14, 1917, and is buried in the Okopowa Street Jewish Cemetery in that city. He is considered a god by the Oomoto religion.